Daniel C. Walker is a man of many talents. Friday I took in the return of “Ernie,” in which his subtle yet startling lighting design is in its fourth season of keeping audiences alert. Saturday the show was Rodgers and Hammerstein’s 1945 musical, “Carousel,” for which he provided not only the lighting and set design, but directed the whole shebang. The Encore Musical Theatre Company is featuring this well-beloved but perplexing musical theater standard through Aug. 10. Written just after “Oklahoma!,” “Carousel” bears a similar tone to its sister. Their scripts and scores are “integrated”; music, lyrics, character and dance all play a part in telling the story, not just added for entertainment’s sake. Both have a somber, even menacing, undertone, lightened by comic relief. Each has a knock-out ballet sequence, both of them originally choreographed by Agnes de Mille. “Carousel” is darker than “Oklahoma!” perhaps because it’s a cautionary tale. It warns that choices have consequences. The setting is a fishing village in Maine. As post-Civil War New England industrialized, the sleepy hamlet has become a boom town, drawing young women to work in a cotton mill. Their diversion is an amusement park by the shore. It’s here that Julie Jordon (Darcy Alexander) and Carrie Pepperidge (Mahalia Greenway) meet a swaggering carnival barker, Billy Bigelow (Joey DeBenedetto), who runs the carousel. On impulse, Julie chooses to stay with Billy past her curfew, thus losing her job. On impulse, Billy chooses to quarrel with his boss, the Widow Mullins (Emily Rogers), thus losing his job. A month later, the couple is living with Julie’s cousin Nettie (Marlene Inman), but their relationship is strained. Billy’s frustration with unemployment has aggravated his temper. His desperation reaches a boiling point when Julie tells him she’s pregnant. He reluctantly agrees to participate in a hold-up with his “unprincipled” friend, Jigger (Peter John Riopelle), a choice that goes terribly wrong. Billy chooses suicide over prison. But he can’t escape heavenly justice. Given the option to return to Earth for a day to tie up unfinished business, he chooses to visit his daughter, Louise (Jennifer Waltz). Time passes differently in heaven, and Louise is now a teen – scorned in town because of her father’s reputation, yet drawn to the seedy carnival life he represented. Can Billy redeem himself by saving his daughter? Oh, yes, “Carousel” is a play about choices – and there’s the rub. Where do directors and actors find the motivations for characters making such obvious bad decisions? In Dan Walker’s vision of the play, it’s not set in an idealized small town, but in the dreary, dangerous reality of its docks and mill. His characters make poor choices because the status quo is unacceptable. 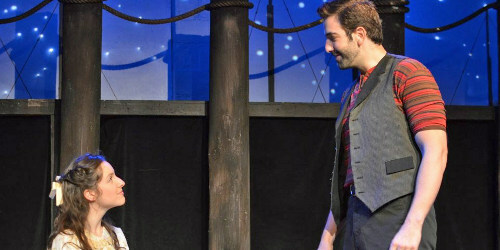 In this reading, as explained in the program’s director’s notes, Carrie and her eventual husband, Enoch Snow (the splendid Jess Alexander), are not just comic relief – but the two are still a stitch. In contrast to Julie and Billy, they are a pair making the right choices. This insight not only solves the problem of questionable motivations, it broadens “Carousel” into a modern morality play. Dan Walker’s scenic design is not the bright lights and colors of an amusement park, but a massive, brooding, bi-level depiction of the fishing docks. The Encore is not a particularly easy theater to light, but Walker succeeds, aided and abetted by Zach Johnson, a really accomplished guy with a follow spot. Costumer Sharon Urick’s color palette employs neutrals and pale pastels, which contrasts nicely with the bolder black and reds worn by Billy and Mrs. Mullins. It’s a visual reminder that the pair represents a life foreign to the staid townspeople. Each principal performer not only ably sings the role, they look the role. The rather petite Darcy Alexander possesses a big, versatile soprano and complements lanky DeBenetto’s broad tenor range in duets. DeBenedetto does not overlook his opportunity to stop the show. His solo, “Soliloquy,” is one of the most difficult numbers in musical theater. At almost eight minutes long, it’s more opera aria than show tune. It requires an artist to reach up in his register for powerful, sustained notes, and down in his soul to find the emotions involved. DeBenedetto doesn’t disappoint. Nor is there disappointment from classically trained Inman singing the inspirational “You’ll Never Walk Alone.” The combination of power and delicacy in her upper range is extraordinary. Peter John Riopelle’s oily, sinister portrayal of Jigger is also a crowd pleaser. But it would appear that the smaller the scene, the better the performances. Solos and duets are superb; the men’s and women’s choruses are a pleasure to hear (especially memorable is the boy’s testosterone-driven chantey “Blow High, Blow Low”). But harmonies blur in full chorus scenes, likely because music director Tyler Driskill and his musicians are in the stage left wings, out of the performers’ sight. Without a conductor, not everyone is coming in on time. In addition, while Sebastian Gerstner’s choreography is beautiful – and the second act ballet really elegant – at times the chorus looked hesitant, even fearful, when dancing. It was most noticeable in the Prologue – “Carousel” lacks an overture – a pantomime set to the “The Carousel Waltz.” It’s a lovely, minor-keyed piece, full of dissonance. There was a little more dissonance in music and choreography opening night than composer Rodgers provided for. There was a time when popular music united the disparate elements of our culture, rather than becoming a tool to prying them apart. I like to think that the contributions of Broadway composers like Rodgers and Hammerstein can continue to span generations. The music is just too good to leave sitting on the shelf.